BIOGRAPHY Yasena Popova was born in Svishtov, Bulgaria, in 1981. 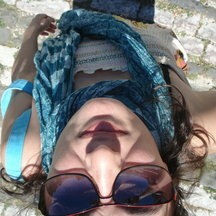 She graduated at UACG, Sofia, major Architecture in 2006. In 2011 started her second Master’s degree in Art of Photography at New Bulgarian University, Sofia. She has been in the Masters class at Sofia Photography School since 2013. Works and lives in Sofia. PERSONAL EXHIBITIONS 2014	Urban insects • Photo art gallery f/2,8 • Sofia, Bulgaria. 2013	Faces of immigrants • Gallery 205 • Sofia, Bulgaria. SELECTED GROUP EXHIBITIONS 2014	The collection. New acquisitions 2012 – 2013 • Sofia City Art Gallery • Sofia, Bulgaria. 2014	Conceptual photography weeks • Synthesis gallery • Sofia, Bulgaria. 2013	Exhibition of the ten nominees for Bulgaria, organized by the ESSL Museum, Vien • Academia gallery • Sofia, Bulgaria. COLLECTIONS Sofia City Art Gallery • Sofia, Bulgaria. Sofia Photography school • Sofia, Bulgaria and private collections.